The FF leader said he had first learned of Crowley’s decision in a phone-call on Sunday night, and that it had been a surprise. FIANNA FÁIL LEADER Micheál Martin has said that some of the smaller parties involved in the European Parliament grouping that MEP Brian Crowley has joined are “racist, xenophobic, and homophobic in many respects”. It’s after the FF parliamentary party met this afternoon do discuss the Ireland South poll-topper’s shock move. Crowley — the country’s longest-serving MEP and Fianna Fáil’s only representative in the parliament until this week — has had the whip removed from him, after members agreed he had effectively expelled himself. Martin said he had first learned of Crowley’s decision to join the strongly conservative and eurosceptic group European Conservatives and Reformists in a phone conversation on Sunday night, admitting it had come as a surprise. It had been assumed that Crowley would remain a member of ALDE, considered a more liberal group in the European Parliament, and whose banner Crowley had campaigned under during the elections in May. Martin said he had had a number of conversations with the MEP on other matters in recent weeks, primarily to do with staffing, and that he considered they had been resolved. “To be frank with you I don’t think you can decide which political grouping you should join on the basis of staffing,” Martin told RTÉ this evening, as he took to TV and radio news broadcasts to give his take on the situation. It was a surprise to me given the group involved … This grouping actually at its core is actually anti-European Union. He said that many parties involved in the group were ‘far right’ and held views that were ‘anathma’ to where Fianna Fáil stood on many issues. “I regret very much that it has come to this,” Martin said. He ran under a Fianna Fáil banner, under an ALDE banner. By taking the decision he took he essentially removed himself from the party. Crowley and Martin have some history together, but the FF leader insisted the veteran MEP’s decision was nothing to do with their much-publicised 2011 falling out over the party’s Presidential election strategy. More recently, there was some speculation that the pair were still at odds when Crowley didn’t turn up for the FF manifesto launch in the run-up to last month’s European elections. The Bandon native said at the time he had prior commitments on the campaign trail, and that he had called his party leader to explain. Speaking this evening, Martin insisted there was no personal animosity between the two men. “I think it’s the wrong decision to make. All members of the group were amazed that he joined this particular grouping,” he told Drivetime’s Mary Wilson. Brian makes his own mind up. Email “Crowley's aligning himself with racist, xenophobic, anti-gay parties --- Micheál Martin”. 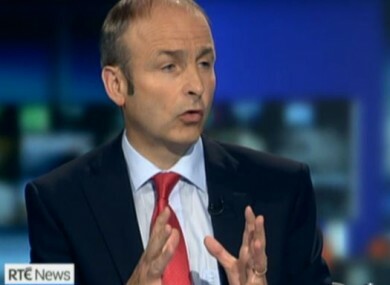 Feedback on “Crowley's aligning himself with racist, xenophobic, anti-gay parties --- Micheál Martin”.